A dozen years ago, mayors and their economic development staff made sure they had a copy of Richard Florida’s The Rise of the Creative Class on their desks. It was the big new idea that would help them understand the dynamics of contemporary urban growth, and plan for the future of their cities. Adopt the urban amenities and policies that are attractive to young, mobile and skilled talent, or see your city left behind, and watch the brain drain to Portland and Austin, whose economies would flourish with educated, networked professionals devising innovative strategies and products. Arts advocacy groups were quick to take note: ‘cool, attractive cities need galleries and theatres and live music!’ And not just any place, but in ‘cultural districts’ where the creative class can stroll down pleasant sidewalks and enjoy the aesthetic offerings. Florida’s influence has been profound – local arts policy became focused on districts and the arts as an amenity attractive to a particular class of individual, and state and federal arts agencies turned their attention from artists and nonprofit organizations to communities and cities. There is not a large body of empirical research that evaluates the success of the ‘creative class’ strategy; there continue to be published advocacy pieces, of course, extolling the importance of the arts in local economic development, but little that has been able to show how different sorts of investments in the arts at the local level really affect economic and social outcomes. So where does it go from here? 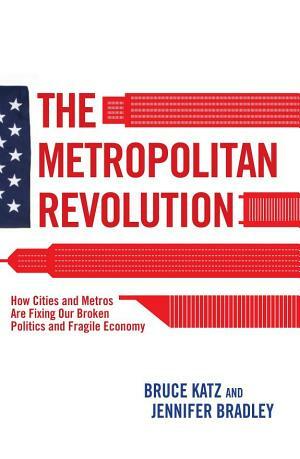 Last summer saw the publication of The Metropolitan Revolution, by Bruce Katz and Jennifer Bradley of the Brookings Institution* (which also published the book). So, the book is no longer hot off the press. But reading it this week, and recalling the attention it garnered in the press last year, I imagine that this book, like Creative Class, will be on the desks or nightstands of mayors and ec dev staffers. And that means it matters for arts leaders. A revolution is stirring in America. Across the nation cities and metropolitan areas, and the networks of pragmatic leaders who govern them, are taking on the big issues that Washington won’t, or can’t solve. They are reshaping our economy and fixing our broken political system. The book maintains throughout the rhetoric of revolution, of urban success stories in the face of national political failure. Interesting case studies on economic and social development in selected metro areas: the efforts by New York City to enhance its high-tech presence; regional cooperation in metro Denver; networks of nonprofits in Houston; trying to rebuild the economy of northeastern Ohio. Cities, metro areas and states have the opportunity to learn from each other’s successes and failures in policy experimentation, and so it is good to read some detailed analysis of what’s going on out there, and not just in the very richest metro areas. Non-partisan – if there is a mention of whether any local officials are Democrat or Republican I can’t recall it, and that is certainly refreshing. 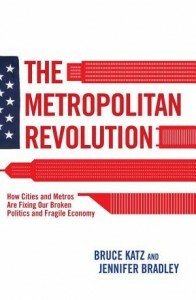 Indeed, a theme of the book is that metro areas are taking the lead in innovative policies for growth precisely because they, unlike the federal government especially, are not bogged down in party politics (although, in my personal experience, simply because there is less attention to party politics at the local level does not mean power-politics does not manifest itself in other ways). Inclusive: although a lot of attention is devoted to innovation as the key to growth (more on that below), it recognizes that there are immigrant and domestic poorer segments of the population that need institutions that will enable them to fully enjoy the benefits of smart urban growth policies. Because, in fact, there are many policy issues that really are best handled, or necessarily handled, at the federal level. Federal fiscal and monetary policy contributed to the great recession and are the basic tools for countering the recession. Any policy that has a significant redistributive aspect from rich to poor needs a significant federal presence, whether progressive taxation, income maintenance and support, and, most recently, the Affordable Care Act. Only the very largest cities can try to have redistributive policies at that level, since it is too easy for the rich to move to a new town (although not so easy to move to a new country) if they don’t like the higher taxes that will fund programs for the less well off. Arts funding is fine at the local level – it can tie with local philanthropy, and fit the cultural preferences of the local population – but even in the arts the key policies are at the federal level: copyright and other intellectual property rights; the tax treatment of nonprofit organizations and charitable donations to them, to take just two examples (and as far as the lives of artists go, the effects of these policies are likely outweighed by federal policy dealing with health insurance). So, yes, metro politicians can do interesting things, but the scope is limited. Is Michael Bloomberg‘s group of mayors really going to solve global climate change? Are metro areas really going to be the drivers of international trade, rather than individual firm strategies combined with federal government trade policies? The same question that persists with Creative Class exists in The Metropolitan Revolution: how much systematic evidence do we have that specific policies work? Any book that tries to capture ‘megatrends’ (this book uses that word frequently) needs some data to persuade. Let me give one example, because I see it as something that, for better or worse, will be the next big thing in urban economic development policy: ‘innovation districts’. These are concentrations (in small areas – a few blocks) of start-up firms and residents, networked across interrelated sectors, that will best take advantage of attracting the creative class and to exploiting knowledge spillovers. In a go-out-on-a-limb section, the authors extol Detroit’s Woodward Avenue corridor as an example of the shape of things to come (there will be a streetcar!). But what do we know – not just on a case study basis but with a full set of observations – about ‘innovation districts’ and metropolitan success? The authors, correctly I think, state that we need to see metro areas as systems rather than focusing on cities proper or their suburbs. That’s fine. But when it comes to policy, there are tensions. In the arts this remains true: should artistic activity be clustered, to best foster innovation? Or is the metro population better served by a more dispersed arts scene. Theatre district, or neighborhood theatres? The authors give a lot of attention to clustering, but I think this is an important question, too important for arts advocates, or urban planners generally, to simply assume an answer. I’m not sure the arts policy community has done as much as it can to tackle this issue (are we willing to accept all the implications of clustering everything in cultural districts? ), and I think there are gaps in this volume as well in dealing with the core-periphery dilemma. Those interested in cities and policy should read this book: it is lively, has interesting case studies, and, even if you question its assumptions or policy recommendations, it will have influence, and it is always a useful thing for arts leaders to know what people are thinking about in city hall. *Disclosure: In 2012 the Brookings Institution hosted a conference which I had helped organize with the National Endowment for the Arts, and Brookings Institution Press published the resulting volume in 2013, edited by me: Creative Communities: Art Works in Economic Development. Previously in my summer books: Astra Taylor, The People’s Platform.